This is somewhat larger than the Mock-Bird, and of a more clumsy shape. Its Bill somewhat long, and a little hooked. The Eyes yellow. All the upper part of its Body of a muddy red, or Fox-colour, except the interior vanes of the Quill-Feathers which are dark-brown, and the ends of the covert Wing-Feathers which are edged with dusky White. Its Tail is very long, and of the same colour of the Back and Wings. The Neck, Breast, and all the under part of the Body, of a dusky white, spotted with dark-brown. The Legs and Feet are brown. 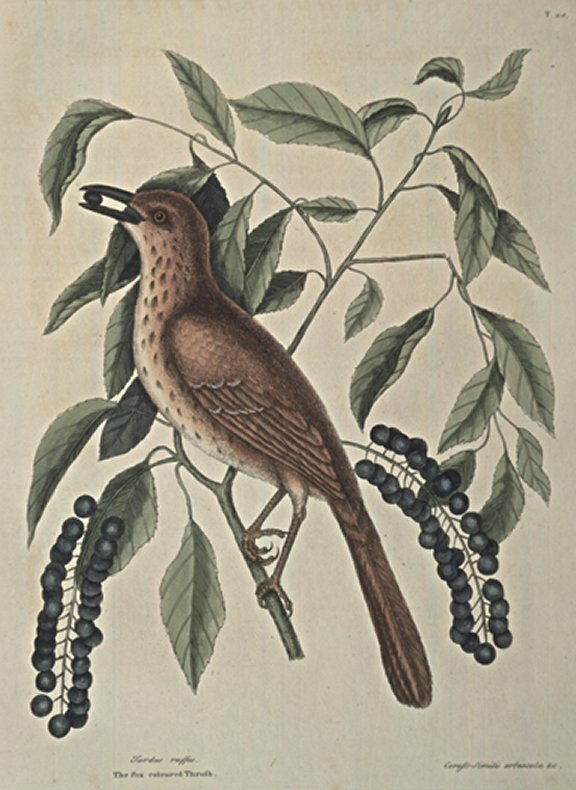 This Bird is called in Virginia the French Mock-Bird. It remains all the year in Carolina and Virginia. It sings with some variety of Notes, though not comparable to the Mock-Bird. This Tree, in the Manner of its growing, resembles much our common black Cherry, in the thick Woods of Carolina, where these Trees most abound. They seldom grow bigger than a Man's leg; but by being removed to more open Places, they become large, some of them being two Feet in Diameter. In March it produces pendulous Bunches of white flowers which are succeded by small black Cherries of a greenish Cast, hanging in Clusters of five inches long, in the manner of Currants. The Fruit of some of these Trees is sweet and pleasant: Others are bitter. They are esteemed for making the best Cherry Brandy of any other, and also for stoks to graft other Cherries upon. They are much coveted by Birds, particularly those of the Thrushkind.